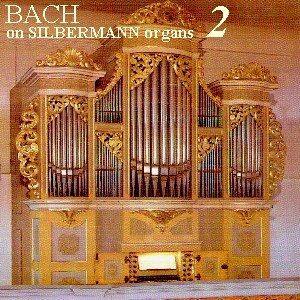 75 minutes of organ music, including the Toccata & Fugue in d-minor and the Schubler Chorale Variations. 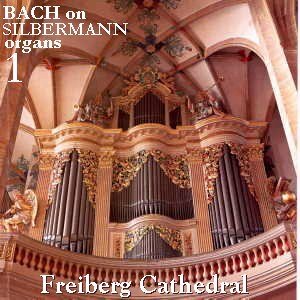 Here we have the music of Bach, perhaps most famous in his day as an organ specialist and virtuoso, played on the wonderful instruments of his friend and contemporary, Gottfried Silbermann. 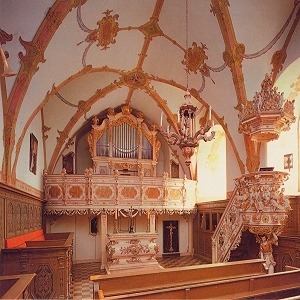 The Grosshartmannsdorf organ is typical of the instruments Silbermann built for numerous small towns and villages around Saxony. It has two manuals and pedal, with 21 speaking stops, and retains its original sound and character. Our 78-minute program includes the Allabreve, the G-Major Fantasia, and some of Bach's major Preludes & Fugues including the monumental b-minor, BWV 544. 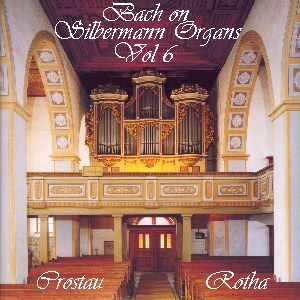 A group of major Preludes & Fugues on the larger Ponitz organ is followed by the Eight Short Preludes and Fugues on the Grosshartmannsdorf organ. Click image at left for full program details. Very highly regarded at the time, the Ponitz organ spread the fame both of the instrument and its builder. Both instruments retain their original sound and specification. 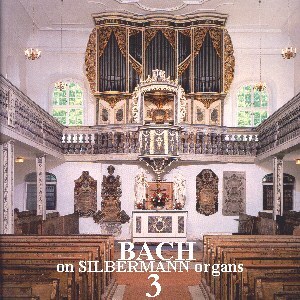 Two smaller organs, in the Village Church of Nassau, and the Chapel organ in Burgk Castle, romantically sited over a curve in the Saale River, with a program of smaller, lesser-known works like the Pedal Exercise, and an unfinished Prelude. Though with Bach, the smaller works are never less interesting or creative. And Silbermann's "Silvery Sounds" can be heard as always! 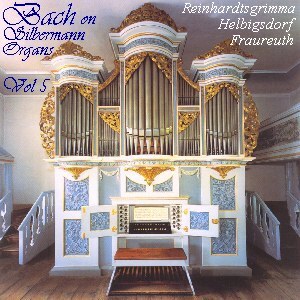 In this fifth volume we visit three typical Silbermann village organs, all of which respond perfectly to the demands of large works (Toccata Adagio & Fugue 564, Fantasia & Fugue 542) as well as the lighter Aria, Trio and Pastorale. Total playing time 79 minutes. We begin and end this program in Freiberg Cathedral, with the monumental Prelude & Fugue "St Anne" BWV 552 and the Canzona. In between we sample three typical village organs. The program includes the Passacaglia & Fugue in c BWV 582 and the "Dorian" Toccata & Fugue. Total playing time 79 minutes. 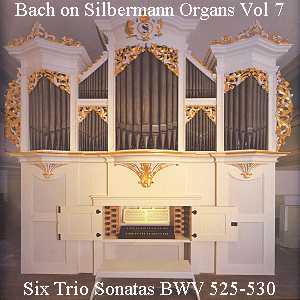 In this seventh volume we visit four typical Silbermann village organs for the Six Trio Sonatas. These works provide an opportunity to hear the clarity of the instruments' individual stops. Total playing time 79 minutes.